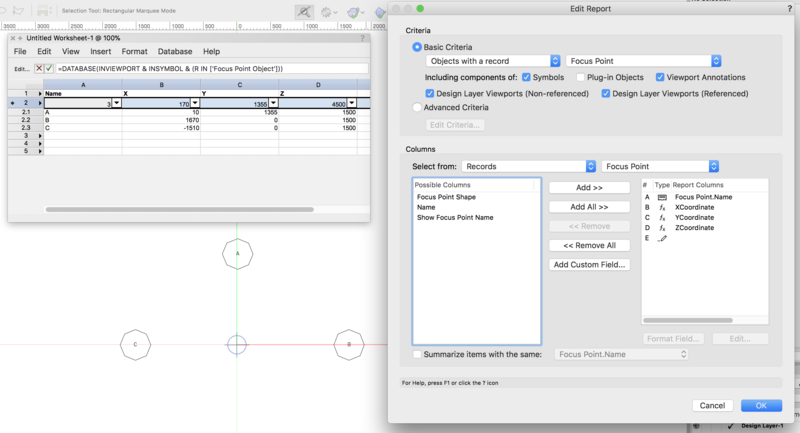 Wondering if there's any way to export the XYZ coordinates of Vectorworks Focus Points and then map them into Lightwright focus points? There's a export "Focus" function in the spotlight export pop up dialogue (See screenshot) but only the focus names turn up. To my knowledge this is not possible to do directly to LW. You could easily make a worksheet of your focus point coordinates if you wanted to work out a focus point map for marking out onstage though. I recently did just this for a production where there was no access to the rig while the set was on stage. So I marked out a focus plot on the stage floor, rolled/flew the set away and focused on to the bare stage. Worked a treat. Lightwright's focus coordinates are text fields and in practical use rarely contain coordinates expressed as X/Y values. In most cases, the entry is something like "6L @ 4", which means 6' SL of center and 4' upstage of center. Other times, they can be something like "Standing on Sofa" or "Leaning on SL proscenium". 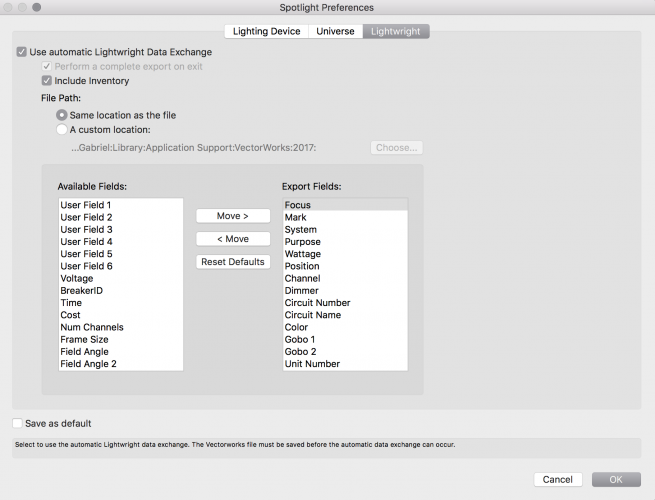 So while focus coordinates could possibly be brought from Vectorworks on a one-time basis into Lightwright in a future release, they would never be able to transfer from Lightwright back to Vectorworks. Thanks for clarifying. I do tend to insert the LW equivalent of XY coordinates in the same field as mentioned - i.e. "6L @ 4" while descriptions such as "Standing on sofa" tends to be in the "Notes" field. I could however see the possibility in spreadsheets to append a suffix "L" or "R" based on the positive or negative values of the x-coordinate in VWX and perhaps assign it to a user field? Maybe we aren't that far off from a text string based field in VWX that might then suit LW export field? Purely conjecture of course. And absolutely out of my league!